What’s a fiddle head? It’s the top of a fiddle fern, duh! Why do you care? Because they taste like ‘yum’! 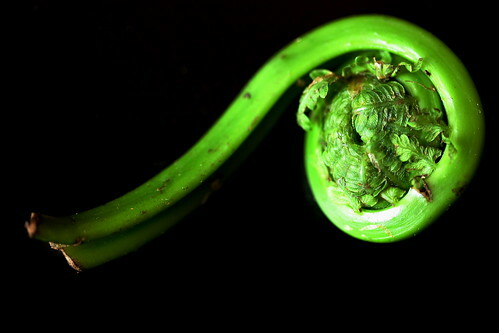 This is a fiddlehead.... fiddle head. I first heard of fiddle heads 2 or 3 years ago from my adventurous, out-doorsy, wilderness-loving brother-in-law Adam. He said he’d seen some while out on a hike and how much he loved them. We’d planned to pick some and cook them up, but never managed to get around to it. Fast forward to last week while I prepped my first CSA order with Holton Farms and ‘boom’, Fiddleheads right near the top. After nipping off the browned ends that cropped in after their journey from Vermont, I steamed my fiddleheads while making some wild mushroom fettuccine (also from the farm truck. made by a pasta maker upstate). I mixed these together with butter (from the farmer’s market, made at a little dairy about 120 miles from my apartment), garlic salt, pepper, and parm. Suuuuuuper good!